Santa Claus is back! 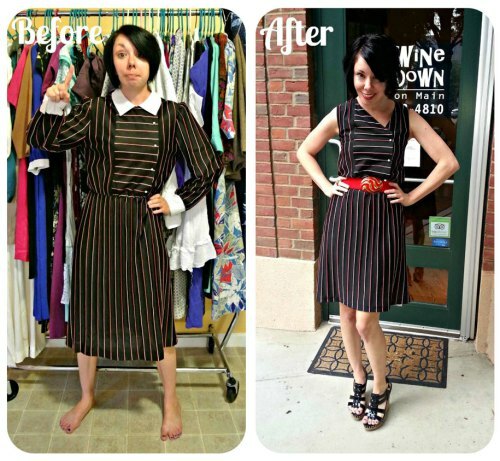 And this time, with a two part series on how to dress slimmer. Well, ok, not everyone wants to hear from cuddly old Santa about slimness, because he’s not exactly known for his killer figure, but nonetheless, we have for you some great tips to use this New Year. Before I launch into this long post, let me start off by saying that we women, no mate what our shape or size – are beautiful. Society has tried to tell us that being slim or being a size zero means you’re beautiful, but trust me, that is absolutely untrue. Real girls and women look a lot better NOT being size zero. But that said and done, we all know how great it is to look slim! Who wants a slimmer jawline, and flat tummy, and toned legs – raise hands! We all want to be slimmer, but did you know that whatever our shape and size, we can also dress slimmer? Sometimes the clothes we wear, gives the illusion of a smaller size, and shape. Very obviously, this lady is not fat, but the revamp of her dress makes her look so much better and slimmer! Well, to help you all look slim this new year, here is a set of tips. 1. Slimming undergarments: The secret in every woman’s closet, slimming undergarments are a boon to look well put together. no matter what your size, wearing a corset, or a waist cincher, or any sort of shapewear, will just push and pull all things in the right direction, and keep you looking toned. A word of caution: Don’t ever buy shapewear online. You NEED to go to a store, however weird or awkward you might feel. Get yourself to a store, get measured, try the shapewear, try some dresses over it, and check the look. Don’t buy the shapewear in a hurry, you need to put aside some time and go when you don’t mind spending a couple of hours in the store. 2. Proportions: No, I am not teaching a Geometry class, but the slimming effect is all about proportions. Some of us have longer torsos, and shorter lower bodies, whereas some have longer legs and shorter torsos. Neither is considered to be perfect, but we gotta love what we’e been given! To elongate your lower half (Most women have longer torsos) high waisted pants and skirts are your best friends. When something buttons higher than your lower waistline, it gives the illusion of longer legs. Also, a high waisted skirt or pant will button higher at your waistline, and thus the dreaded ‘muffin-tops’ will be avoided. And let’s face it, jeans that sit on your knees are definitely tacky! Similarly, if you have long legs but a shorter torso. wear a longer top to hide that fact. It will instantly give you a leaner look. 3. Cinch your waistline: Again, the above photo. Cinch your waistline with a belt. Cinch it at the smallest part of your waist, and it instantly creates an hourglass look, that will make you feel amazing. If you want, you can also wrap a sweater/jacket to cinch your waist so that it creates a cohesive look with the whole outfit. For example, if you’re wearing a whole monochrome outfit, tie a different coloured jacket at your waist to give that pop of colour while giving that pop of slimness! 4. 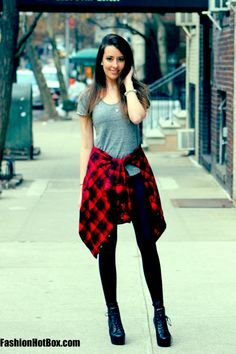 Cover up: With a skinny jeans and blazer. This is the outfit of choice for all glamorous women, it will make you look slim, because of the proportions game mentioned about. Just make sure your blazer length hits you at the right spot. Too short a blazer and you will look weird , and too long you might look like you have just entered from the 90s. 5. Accentuate your BEST part: Each one of us, has some part of our bodies, we love. Maybe your legs, your hands, neck, or whatever. Try and wear clothes that flatter your favourite part. For example, if you have a great waistline, wear a lot of sarees, or high waisted skirts, or cinch your dresses with belts. If you want to show off your arms, wear sleeveless tops or some great eye catching accessories which call attention to your arms. So play around with accessories and clothes to bring attention to your favourite body part! That concludes our Part 1, but stay tuned or part 2! A very very Happy New Year from the EthnicThread team to all you lovely Threadders out there.